Elkhart Catering strives to provide the highest standards of corporate event catering services. Our catering professionals give personalized care and attention to details. We have been trendsetters in presentation of menus ranging from classic to elegant dishes. As per specifications, we can also create a menu to impress clients at their choice of location. We understand how important it can be for your company to make a solid impression. Our experience in catering allows us to come up with packages to suit different budgets. We specialize in catering at meetings, dinner, product launches and conferences. The experts in our team will deliver nothing short of reliable services to ensure complete success. Our knowledge and experience also allows us to give advice, guidance and assistance on other aspects of a corporate event. The colorful and adventurous creations are designed to satisfy even the choosiest of guests. Our catering formula blends value, quality and service irrespective of occasion ranging from a business luncheon to big corporate events. We make sure our premises meet the highest professional standards relating to food hygiene. The catering practices of our professionals are also eco-friendly. Planning a corporate event is quite challenging and we leave no stone unturned to make it a complete success. Banquets, boardroom luncheon, buffet, dinner parties, retirement parties and cocktail parties have their own set of requirements. Apart from regular staffing, we also have waiting staff that can bring the additional touch of class. Our chefs are well trained and qualified to come up with specific menus and cuisines. Anyone willing to know more about of corporate event catering services is welcome to contact us by mail or telephone. Whatever your needs, we can deliver you the best possible catering. 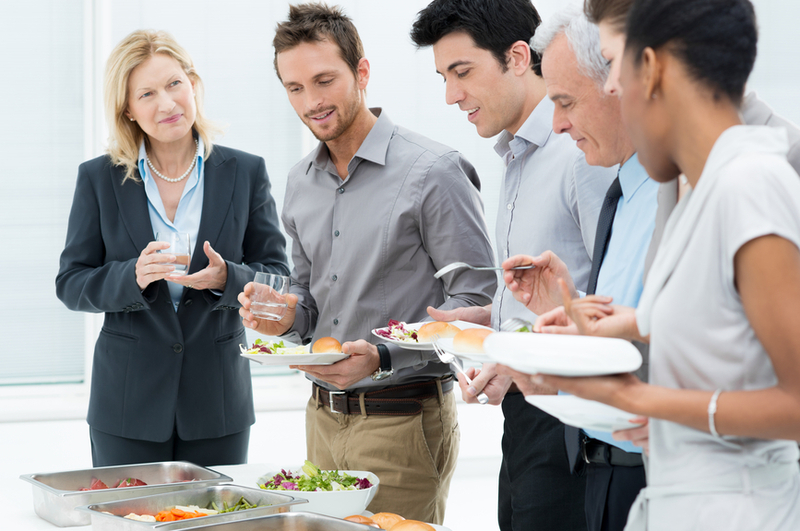 Our corporate catering business is run by people who are passionate about food and service. Be it cuisine, set up or staffing, everything is delivered with a personalized touch and environmental conscience. Even an event like charity fundraiser calls for arranging the best possible options in starters, main course and desserts. Our event staffs and chefs have the expertise to ensure a pleasing catering experience. The ingredients provided by suppliers go through a process to ensure these are fresh, quality and tasty. We make sure these are sourced locally and meet strict quality standards. Packaging is selected on the basis of food safety standards. As soon as the platters are finished, we have staff to collect the remains to recycle them or dispose them. Our team has a bunch of motivated, positive and enthusiastic people for whom no task is too big or too small. We have over a decade of experienced workers in the field help us to deliver flawless service for office lunches, business events and business lunches. Our catering company has grown to become one of the most renowned names in this field. All the necessary arrangements for corporate event catering are done in a timely manner. Orders can be placed online as per your convenience 24 hours a day and 7 days a week. Our uniformed staff can confidently deliver unforgettable experiences.